This instrument is particularly popular with The Monteverdi Choir and Orchestra, with whom it has travelled all over Europe and taken part in many recordings and concerts of both the Baroque and Classical eras. When not on hire elsewhere, it lives in the famous Archer church of St John's Smith Square which has been converted into a concert hall. 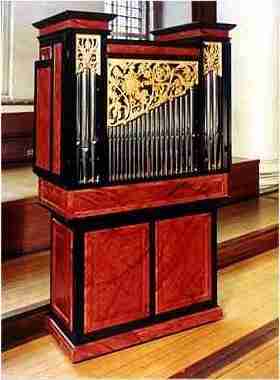 It is a sister instrument of the Peabody Institute organ but the scaling and voicing are slightly different. The casework decoration has earned this instrument the nick-name "Raspberry Ripple" amongst the musicians of England. The instrument can be transposed to A415 (baroque pitch) whereby, unusually, the low C is retained. It can and often is tuned to A430 for music of the classical era. All stops divide at middle C which affords the instrument extra flexibility. In order to be transported, the top lifts off the bottom. The winding is traditional with a hinged bellows in the base. On one occasion, this organ was lost by an airline in Madrid. After a week, somebody from the airline went to Madrid and found it upside down in an aircraft hanger, in its packing cases. On another occasion, it got caught up in some moving scenery at the Royal Opera House in a rehearsal of Taverner by Peter Maxwell Davies, which caused it to fall flat on its face, narrowly missing a boy singer who had the presence of mind to crouch down as it fell over his head. Fortunately, it fully recovered from both experiences.